The beautiful Opal traditional and a royal look to a special you. 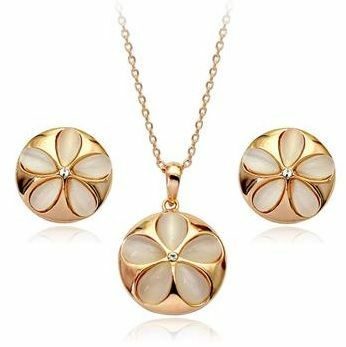 This soothing creamy looking jewelry Set has a 3 layer real gold plating that give an extra lustrous shine. The gemstone Opal makes the jewelry look extremely attractive and royal. This is a classic Italian Model. Beautifully placed and packaged in a Gift Box for the special you.